Figure 1. Bearish Strong Line pattern. The Bearish Strong Line is a one-line pattern that can be classified as a bearish reversal or bearish continuation, depending on the market context in which it has been formed. If the whole body is placed below the trendline, we are dealing with a bearish continuation variant. When the opening price is above the trendline, we have a bearish reversal pattern. 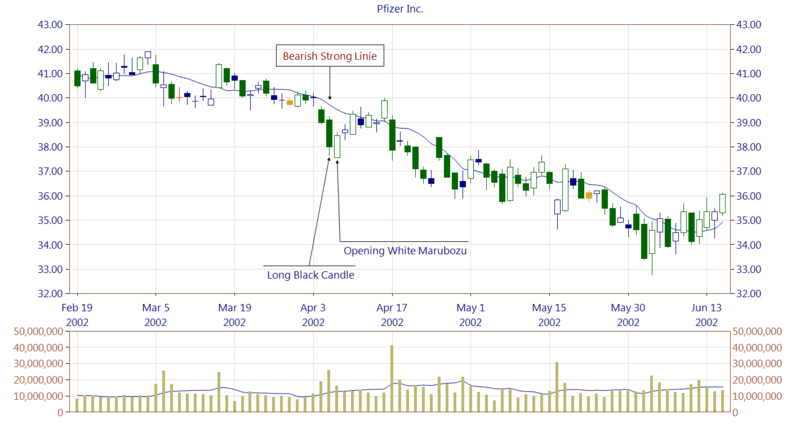 The pattern may be formed by the following basic candles: Long Black Candle, Black Marubozu, Opening Black Marubozu or Closing Black Marubozu. What is crucial is that the candlestick body needs to be at least three times longer than the average body of the last 5 or 10 candles. Some other authors, for example, Bulkowski, are describing the pattern called Long Black Day. 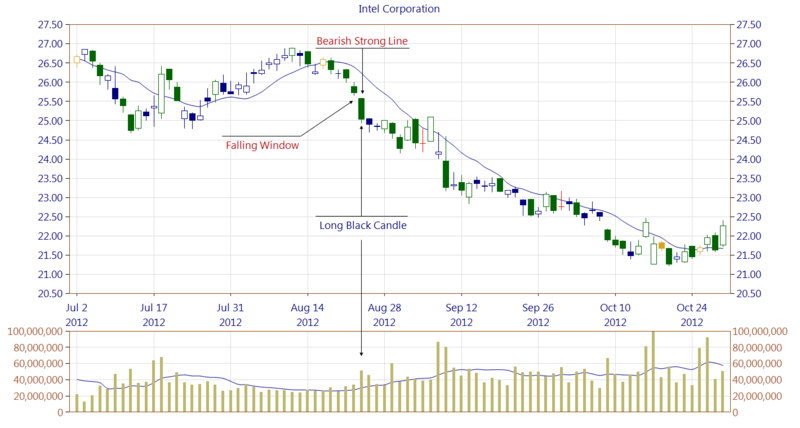 In our approach, what they treat as a Long Black Day, we call Long Black Candle, and it is a basic candle. We introduce the Bearish Strong Line pattern, because apart from the case where the candle contains both shadows (Long Black Candle), we also allow marubozu candles. It makes sense, because why to exclude perfectly strong black candle only because one or two shadows do not exist? 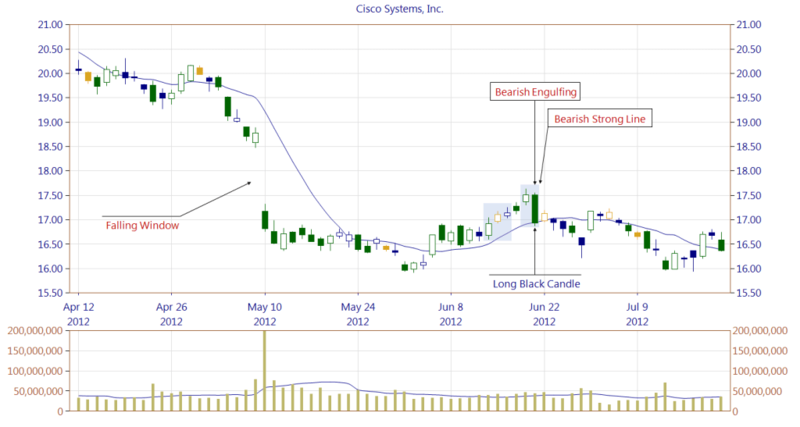 The Bearish Strong Line forms a resistance zone, which is stronger when the candle appears at a higher trading volume. It may happen that at the same time the pattern may be considered as the Bearish Belt Hold pattern (Opening Black Marubozu basic candle). Such occurrence of Bearish Belt Hold should be seen as very bearish because we deal with a candle body being at least three times higher than the average body of the last 5 or 10 candles. There are even more patterns in which the Bearish Strong Line may appear. For example Piercing, Bullish Harami, Bearish Engulfing, Dark Cloud Cover. As a rule of thumb, the pattern should not be ignored, because it forms a significant resistance zone. It may be especially important in the context of bullish patterns where the Bearish Strong Line exists. The Bearish Strong Line occurs often on the charts which make this pattern useful from the trading perspective. However, its efficiency should be evaluated for a particular market/asset. Figure 2. A Falling Window forming a very wide price gap acts as a very strong resistance region. The bulls try to counterattack and fight without success. 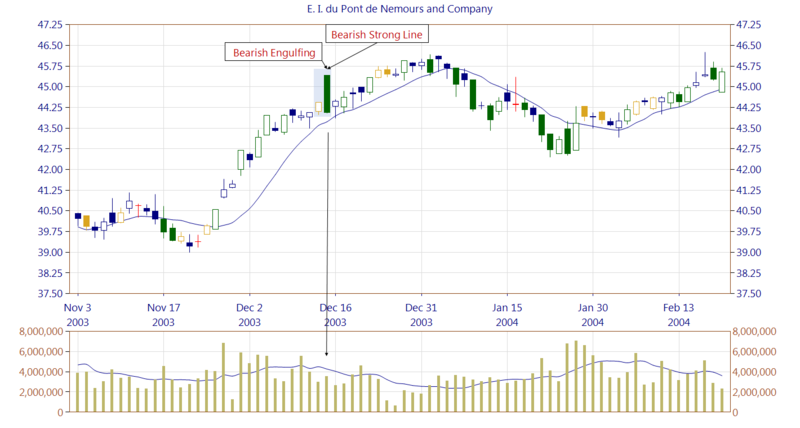 A Bearish Engulfing pattern appears which second line is a Bearish Strong Line. Price drops, strengthening the resistance zone. Figure 3. A Bearish Engulfing and Bearish Strong Line are preceded by a strong uptrend. Two price gaps and white bodies formed at a high trading volume, higher than the average, forms a strong support area. All these indicate that the bulls control the stock. Appearance of the bearish patterns in such context, formed at a low trading volume, cannot reverse the uptrend. They were able, however, to slow it down. The Bearish Strong Line was not confirmed, but although its relatively low trading volume, forms a resistance zone making the bulls' life harder. Figure 4. A Falling Window, which second line is a Bearish Strong Line, forms a very strong resistance zone, because of the very high trading volume. The Bearish Strong Line is confirmed showing the determination of bears to push price lower. The bulls try to steal the ball, but the bears are regaining control. Figure 5. A Bearish Strong Line is formed at a high trading volume. The next day the market gaps down, but eventually closes in the middle of the pattern. This should be a warning for the bears, indicating that the bulls have still something to say. The bulls and the bears are struggling for control of the market. 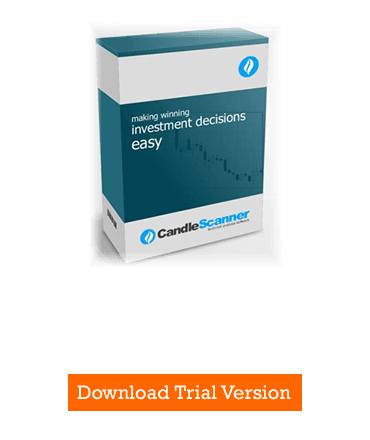 Below you can find some Bearish Strong Line pattern statistics calculated by CandleScanner software.